NC Teacher Stuff: Busy Builders, Busy Week! In PreK and kindergarten classes across the country, children are starting back to school and one of their tasks will be to learn the days of the week. They'll probably learn a cute song, but as a follow-up, might I suggest this colorfully busy construction crew? They're a little wild, but that's part of the fun. On Sunday, the team gathers at a site in the city. This is a chance to plan and brainstorm what they want to accomplish. What an opportunity to talk about the writing process! As the construction crew plans their project, students can plan their piece of writing. Monday comes and it's time for demolition. This part seems like the most fun to me. Tuesday calls for mixing and fixing. The rhymes in Busy Builders will make for a great shared reading experience. With Wednesday, it's time to load and haul. Clues as to what the crew is building come fast and furious which is the perfect opportunity to practice predicting. I think you could also make a circle map and list the types of transportation vehicles that you see in the book. After two more days of work, it's time for the big reveal. Every creature is wearing their finest as they invite the neighborhood to enjoy the fruits of their labor. How many of your students will be able to guess what was built? Fun, fun, fun! That's what you will have when you share this book with your class. It's always a good time when you can share a rhyming text accompanied by sunny artwork that can't help but bring a smile to your face. The characters in the book have a bounce in their step and you will too after reading Busy Builders, Busy Week! What a wonderful way to link Jean's delightful book with a literacy hook. The enthusiastic bouncy tone of your post reflects just how I feel when I turn the pages of Jean's latest. And the illustrations are great as well! 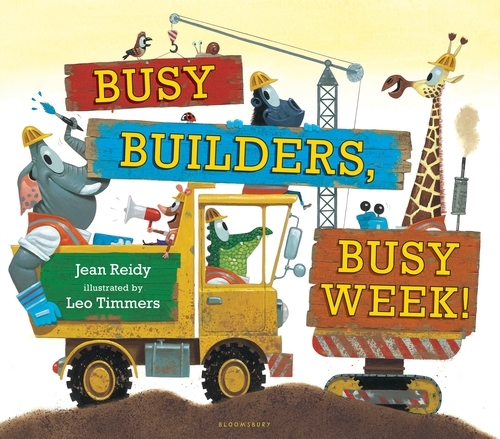 Of course, Busy Builders, Busy Week could be the introduction to an author study as well -- Jean has several kid-captivating books out there. Thank you for your kind words, Boni. And Jeff, thank you for this lovely post. Teachers, I love connecting with classrooms all over the country via Skype. Give me a shout. And in the meantime, have a wonderful start to your school year.